Jonesco manufacture a variety of products including; mudguards, fixing systems, antispray flaps, toolboxes, fire and safety equipment. 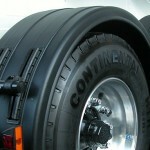 They provide mudguards in medium and high density polyethylene and steel. With over 9 Million mudwings sold they supply the largest range of sizes from one manufacturer to the original equipment / aftermarket commercial and leisure vehicle markets. Their major share of the UK market is complimented by international sales to a further 43 countries.